JVA & JVB Season Updates! 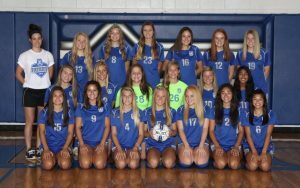 As of September 20th, the JVA squad led by first year Coach Melinda Stemen stands at a record of 4-4-1, most recently ending a scoring drought with an 8-0 victory over Westerville South last Thursday. Scoring has been shared evenly this season, and you can find the JVA Roster and season stats to date listed HERE. Freshman Alexa Hill leads the squad with 3 goals, while Sophomores Sydney Rohl and Olivia Brinkman have each netted two tallies. Six others have contributed single goals, and Alexa Hill and Junior Captain Miranda Stefanik lead the team in assists with three each. The defense is anchored by the Goalkeeping duo of Sophomore Sav Blessing and Freshman Alyssa Ruddock, who have a .78 Goals Against Average (GAA) on the season. The defense has been led by Brinkman, with contributions from the balance of the roster’s talented defensive players. Junior Captain Mia Hill has paced the central midfield with a strong cast of players in support. Next up for the JVA Pattys is at Westerville North on Tuesday, September 25th at 5:30PM. Good luck with the rest of the season! 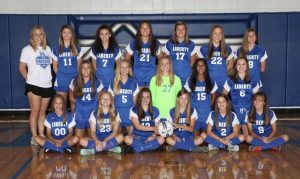 The JVB Pattys have turned in an impressive record of 7-2-2 to start the 2018 campaign under first year Coach Allison Ruman. The JVB’ers have tallied 28 goals while allowing only 7 scores in the first eleven games. Freshmen Kelly Rothert (11 goals) and Jordan Rich (9 goals) lead all scorers, with Frehsman Mallory Rivard and Rich each contributing four assists. Freshmen Sierra Kirby and Alexis Drew have shared duties between the pipes, for a .64 GAA on the season, with Freshman Jessica Lilko anchoring the back line. The team is captained by Sophomore Chelsea Chandos and Freshman Ava Billy and Sierra Kirby. You can find the roster and season stats to date HERE. Every member of the roster has made solid contributions, and best wishes for continued success! Mark your calendar for the Pattys JVB match in Patriot stadium on Monday, October 1st at 7PM vs. Westerville Central.